Hungry for the attention of her absent father, ten-year old Maira hides behind the screen of her ipad constantly facetiming him but also avoiding the loving presence of her mother. Videos shared from these devices paint a picture of a happy family until one day Maira stumbles upon the truth that is both a sobering and transforming for her. Arpita Kumar grew up in India and works as a filmmaker and Creative Lead for Google in the US. She was a writer for the Minimum Wage series on UMC developed by Project Green light Digital Studios, Issa Rae Productions, Adaptive Studios, and Color Creative TV. Her award-winning films have screened internationally at numerous film festivals such as Mill Valley, Atlanta, Sarasota, Cleveland, etc. She was a San Francisco Film Society fellow for her feature film in development called Gori and a Film Independent’s Project Involve directing fellow where she wrote and directed a short narrative film, My Dear Americans that won the PBS People's Choice Award in 2014. She has a MFA in Film/Video from California Institute of the Arts (CalArts), a MA in Comparative Literature from The University of Iowa, and a BA in Film/Literature from Hampshire College. 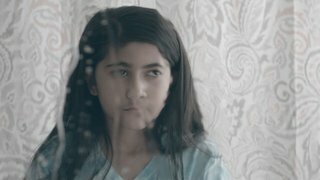 Read the full Q&APBS spoke with Writer and Director Arpita Kumar, about the role water and technology play in the transformation of main character Maira's relationship with her mother. PBS: The use of water is present throughout the film. We see this as Maira and her mother drive through a car wash, when Maira is playing with the garden hose, in one of the phone photos, and when Maira is washing her hands before dinner. Can you explain the reason behind this? Arpita: While working on the cinematic look and the visual composition of the film, I was interested in showcasing Maira’s point-of-view. Children her age are often glued to screens. The rare moments they look up, it is because their attention is drawn to something new or otherworldly. Their glazed eyes become alive with wonder. We used water to create these moments of wonder for Maira’s character. Water also became a visual metaphor for the small transformation Maira would undergo through the film - from being icy cold to her mother to becoming fluid and empathetic towards her. The Center for Asian American Media (CAAM) is a nonprofit organization dedicated to presenting stories that convey the richness and diversity of Asian American experiences to the broadest audience possible. We do this by funding, producing, distributing and exhibiting works in film, television and digital media. For 37 years, CAAM has exposed audiences to new voices and communities, advancing our collective understanding of the American experience through programs specifically designed to engage the Asian American community and the public at large.